Predict Kings XI Punjab’s score after 10 overs and win signed player jerseys courtesy our kit partners T10 Sports. Kings XI fans, this is your chance to win signed jerseys of your favourite KXIP players. All you need to do is predict the Shers’ batting score after ten overs. You need to get the right score and the number of wickets after 10 overs of the Kings XI Punjab innings. The one with the correct or closest answer stands a chance to win signed jerseys from our players. 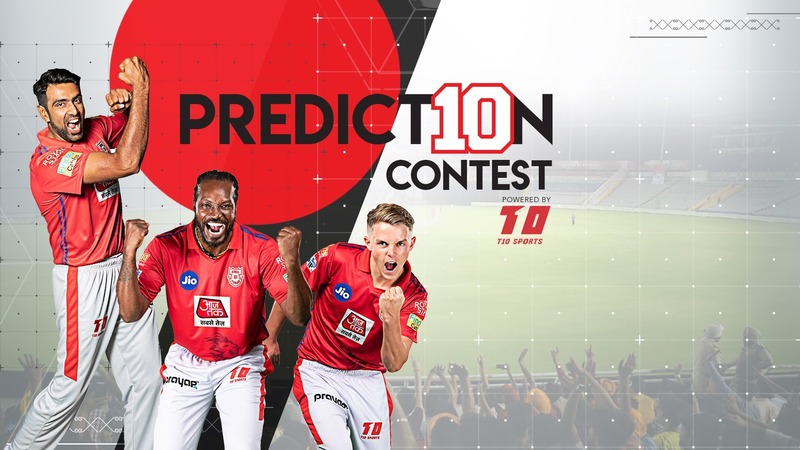 Make sure to leave your prediction in the comments below before the end of the powerplay overs (6 over mark) of Kings XI Punjab’s batting. Any prediction after that will not be considered for the contest. Best of luck Shers! Get your thinking hats on and predict to win big. Contest closes at the end of the powerplay overs (6th over) of the Kings XI Punjab batting. Contest will be cancelled in case match has been abandoned or if the 10th over of the KXIP batting is not bowled. In case of multiple right answers, KXIP reserves the right to select one correct answer at random. To participate in the Contest, you have to post your comment in the Facebook Comments box at the end of the article. These prizes are non-transferable and cannot be exchanged for cash or other prizes. The decision of the Kings XI Punjab team on all matters relating to or in connection with this Contest (including the selection of the winner) will be final and binding on all parties concerned. It will be the discretion of the Kings XI Punjab team to decide the giveaways. The Kings XI Punjab team reserves the right to postpone, change, amend, extend, withdraw and/or cancel the Contest at any time or to accept or reject any entries at their absolute discretion without giving any prior notice and without assigning any reason whatsoever, any point of time and the participant shall not bring any claim against Kings XI Punjab in this regard. Participants must have a valid Indian postcode and address. Only the first comment of the participant will be considered.